I was planning on finishing a lengthly blog post describing what we found, but this week was more overwhelming than expected so it will have to wait until next week (see updates above). However, since we've spent time time talking with the media about the project, I suppose I can free-ride on the coverage that it's getting and send interested readers to articles in The Economist, NPR, The Washington Post, Science, BBC, Scientific American, Slate and other news sites. For folks interested in additional material, Kyle has posted the replication code on his website (it's also posted as a file under Supplementary Materials on the Nature site, but Kyle's site doesn't require a subscription). I've also posted this Google Earth file which let's you look at the data we used to make the cover image (above), although it doesn't look as "nice" because the data in the cover image is smoothed for aesthetic reasons. Below is a video I made using slides from the talks I've given in academic seminars. 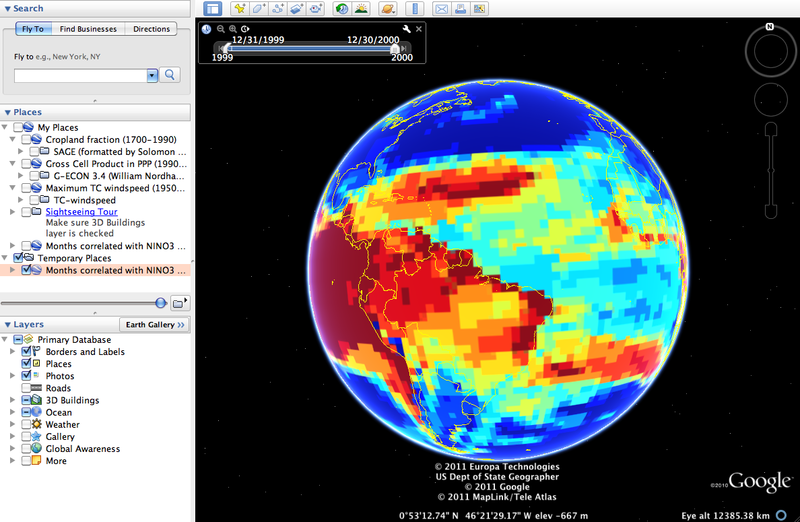 It let's you see the impact that ENSO has on surface temperatures around the world. If you want to take a closer look, you can download a PDF "flipbook" of these images (10M file).